Remarkable in its painterly qualities, the portrait of Baertje Martens holds a special place in the Rembrandt collection at the Hermitage. Conceptually the work is closely tied to the companion painting of Baertje Martens' husband, the ebony worker Herman Doomer. The fate of these two portraits is a traditional, but still extremely distressing story. The paintings of the couple were commissioned for the family and were preserved by two generations of descendants. By the mid-eighteenth century, through several auction sales, the works ended up in different collections. The portrait of Baertje Martens has been in the Hermitage Gallery since 1767. The painting of her husband has been in the collection of the Metropolitan Museum in New York since the 1930s. This is the first time in 250 years that these portraits are being exhibited in the same city. Even though the documentary evidence of the commission is lost, researchers have established many details relating to the subjects' biographies. Baertje Martens (1596–1678), born in Naarden, not far from Amsterdam, married Herman Doomer (1595–1654) in 1618. They had seven children; one son, Lambert Doomer, studied in Rembrandt's studio in the early 1640s and later was known as a talented artist. It is believed that Herman Doomer, a successful frame maker, could have supplied Rembrandt himself (although no documentary evidence to support this has been found). The family's financial status is clear from the fact that in 1637 the couple lived in Amsterdam on Hartenstraat in their own house. Around 1640, the head of the family commissioned the pair of portraits from the famous master Rembrandt. Although only the man's portrait is dated by the author (1640), there is no doubt that both portraits were done around the same time. Baertje Martens would be turning forty-four at the time the portrait was painted. She is depicted almost frontally, seated in an armchair with a high back. The light falling from the left softly illuminates her face, the broad round collar, and her clasped hands. The model's pose is stable and static, but the expression of her face is filled with inner mutability. Subtle changes of light and shadow give it an amazing vitality and naturalness. The artist avoids linear elements, softening the contours with halftones. The shades of color of the skin on the face and hands are presented with rare conviction. (Rembrandt's contemporaries praised him for this feature of his painting.) The woman's gaze directed at the viewer and the shy smile touching the corners of her lips are astonishingly relaxed. Rembrandt uses a characteristic manner in depicting her eyes: the lower and upper lids are shaded with a warm pink halftone, giving the gaze special moisture. Baertje Martens poses in formal, expensive clothing. Tiny buttons ornament her black silk corsage, over which is a fur-trimmed vlieger (a winter top with removable sleeves). This detail of the painting is carefully described in an auction catalogue of 1767: "Portrait de femme vue de faces à mi-corps, elle est assise, les mains l'une dans l'autre; son habillement est noir garni d'hemine..." The details of her costume, for instance, the edges of the white shirt peeking out of the black sleeves, are painted with virtuoso variation: the right with thick parallel brushstrokes, the left with a dynamic line that covers the wrist. In the original version, revealed by X-rays, the depicted woman held a handkerchief in her left hand, a detail that Rembrandt painted over while working on the portrait. The chamber nature of this work and the minimum of accessories set it apart from the patrician formality of other female portraits painted by the artist around 1640. These distinctions are appropriate to the modest social status of the wife of an ebony worker. Nevertheless, Rembrandt communicates the charms of the middle-aged model so well that the portrait of Baertje Doomer can be considered one of the most brilliant examples of his profound psychological acuity. We know that Baertje, who owned both paintings after her husband's death, valued them highly and preserved them as family heirlooms. In several wills, the first of which was dated 1654, she expressed the wish to leave the "portrait of herself and her husband, executed by Rembrandt" to her son Lambert on the condition that he make copies at his expense for all his brothers and sisters. We do not know whether Baertje Martens' wishes were observed completely. At present we know of copies of the portraits created by Lambert Doomer in 1644 (Devonshire Collections, Chartsworth). Compared to the originals, there are several formal differences. There was another copy of the portrait of Baertje Martens in the early twentieth century in the Pichou Collection in Paris. 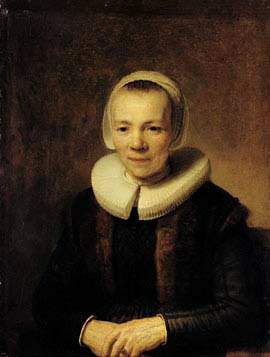 Like most of the Hermitage Rembrandts, Portrait of Baertje Martens came to Russia from France. In 1767 the painting was bought in Paris for 1,155 livres by the merchant Pierre Remy, who represented the interests of Prince Dmitri Alexeyevich Golitsyn (1734–1803), an outstanding Russian diplomat, scholar, and art lover, the chief art agent for Empress Catherine the Great. Soon after its arrival in St. Petersburg, the work was included in the printed catalogue of the imperial gallery in 1744 under the title Portrait of Rembrandt's Mother. This curious definition must have come about from confusion with another painting bought at the same auction in Paris in 1767. The sitter's name, Baertje Martens, was restored only in the early twentieth century. Portrait of Baertje Martens, on exhibit since the late nineteenth century at the Hermitage in the special Rembrandt Room, is deservedly considered one of the main highlights of the celebrated collection.